"Church Planting is my forte"
"Pastor Paul, as one of the Board of Trustees of Know the Way (KTW) Davao City Mission, what area would you like to help in?" The local KTW director was placing each member into a field of volunteer ministry. "Church Planting is my forte." I responded, "Five years ago we planted a church in Laverna Hills, and now it is time to plant a daughter church in Relocation Area." "Great! You will be chairman of the Church Planting Division. We will give you 1000 gospel tracts, a free evangelistic concert, a copy of the "JESUS" video in Cebuano language, and ten New Testaments for the follow-up Bible Studies." "PTL! As the first recipient of KTW aid, we'll also be the prototype for help to other Davao church plants!" "If you die today, will you go to heaven?" Tingles passed through my body as I prayed that the Holy Spirit would draw the buyer of our van to repent of her sins and become a believer in Jesus Christ. A week ago we'd put a FOR SALE sign on our van. We needed the money urgently, due to the fact that our teachers' salaries were due and we were still waiting for the bank to clear our funds. Four different people wanted to buy it, but on the sale date, only one came up with the cash for a reasonable offer. Low, but reasonable. We spent the day waiting at banks for them to come up with the cash. Then they changed their minds, then changed them back, then wanted to lower the price. Elvie was not happy, and even suggested that we not sell after all. The buyer had been complaining that the van squeaked, and the door handle didn't work...picayune little things. Finally we were at the lawyer's office, signing the deed of sale. After signing the papers, I suggested that we pray. Our lawyer, a strong Christian, suggested that I ask the buyer if she was a Christian. I asked, "If you die today, will you go to heaven?" She said "Yes." Then Elvie asked her what reason she would give God to allow her into heaven. When the buyer said it was because she was a good person, Elvie explained that nobody is good enough to get to heaven. Tingles passed through my body as Elvie was talking to the buyer. "Lord," I prayed silently, "Please speak through Elvie right now. May your Holy Spirit move this woman's heart to repent of her sins and be born again!" Two days later, one of our church members said she'd seen us in the bank and had gone back to work and prayed at her desk that we'd get a good price on the van. We got better than that- a soul was ushered into the Kingdom of God! One postscript-the buyer's son had been working as a mariner on a ship, and happened to be home on vacation. He was there when his mom prayed the sinner's prayer. He said, "On the boat, I prayed a lot. But since I've been home, I forgot Jesus. 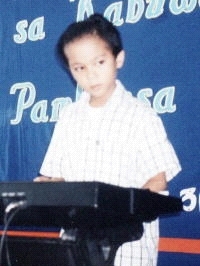 Now I remember. I'll live for Him!" BARNERS: EN ROUTE TO HONG KONG! PJ and Abby were attached to my visa until it expired in Sept. We'll spend 2 wks in Hong Kong (it neighbors the Philippines) and return, thus reactivating our permission to be in this country. While gone Elvie and I will speak at many churches of Filipinos who are working abroad. Pray that souls are saved. 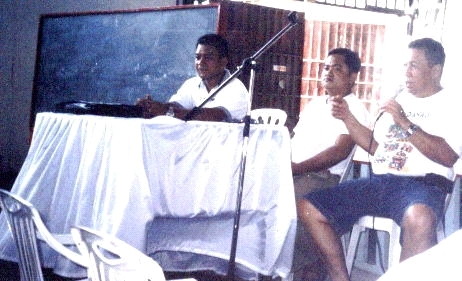 BLC hosts a town meeting with (l to r) the police chief, Barangay captain & the president of the homeowners association. The president of our homeowners' association was perplexed. "Pastor Paul, there is a lot of crime here in Laverna Hills. Could we use your Barner Learning Center gymnasium for a town meeting of all the homeowners?" "Of course! We'd consider it a privilege!" Three days later 80 homeowners from all different religious backgrounds, came to the school, along with the local police t chief and the barangay captain. As each person entered the campus, I handed him or her a tract of the citywide "JESUS REVOLUTION" fasting and prayer day coming up next month. Four hours of discussion on local crime ensued. Finally I was asked, as host, to close the meeting with prayer. 1-Common sense: Put locks on doors and don't hang clothes outside where people steal them. 2-Contact authorities: the police department is developing a 911 emergency number. 3-God: Become a Christian, and join the "Jesus Revolution" Day of fasting and prayer! It's been three years since our last furlough, and we're now planning on being in the USA from June'2003-April of 2004. Would you like for us to visit your church? Please contact Bud Barner for available times, at budbarner(at)juno. com. "Because you have all the answers, I have all the questions." -Our 5 yr old son PJ's response when I asked him why he keeps asking "Why...?". "In the Bible, Titus comes after 1 & 2 Timothy!" - My brother Tim's (my son Tim, "PJ"'s namesake) response when asked where he got the name Adam Titus for his son, born 8/30/02.